SPRINGFIELD, Mass. 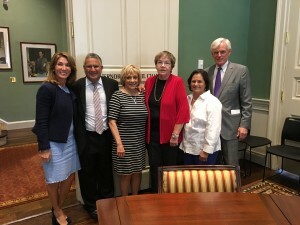 – Mary Hurley, retired associate justice of the District Courts of Massachusetts and former two-term Mayor of the City of Springfield, today met with the current Governor’s Council in Boston. Hurley met with the Governor’s Council members to introduce herself and get acquainted with them. She also met with Lieutenant Governor of Massachusetts, Karyn Polito and discussed the many judicial vacancies facing western Massachusetts and they plan to meet again in the weeks ahead to identify the most critical needs to be filled. Mary Hurley, easily beat her opponent in the September 8th primary election, defeating her opponent in all but 12 towns in the 96-town district. Although still on the ballot in November, with no Republican opponent in the general election, she will assume the governor’s councilor role, where she will vote on nominees for judgeships, clerkships and parole board members. For more information on Mary Hurley please visit electmaryhurley.com.